The oncology therapeutic landscape has been transformed with the use of immune checkpoint blockade (CPB) therapy. However, more than 60% of subjects treated with CPB therapy will either not respond or eventually relapse. Resistance to CPB therapy has been linked to impaired immune cell infiltrate into the tumor, impaired cytokine response, and deficiencies in antigen presentation and processing including altered expression of the major histocompatibility complex class I.
Adoptive transfer of NK cells has the intrinsic potential to overcome many of these CPB resistance mechanisms. However, the currently available approaches to NK cell therapy have been limited in part by challenges with mass production and dose to dose variability. To address this opportunity, we are developing FT500, a first-of-kind, universal, off-the-shelf NK cell cancer immunotherapy derived from a clonal master iPSC line. 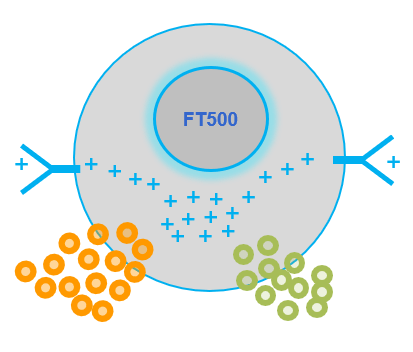 The use of a clonal master iPSC line for the production of FT500 uniquely provides a large, homogenous population of NK cells that is well-defined and displays potent activity including the ability to synergize with T cells. In addition, FT500 can be cryopreserved and available for repeat clinical dosing.